Jakarta is the capital city of Indonesia. It means, it is the center of economic activity for most Indonesian people. More than 30% Indonesians live in Jakarta. Can you imagine how crowded is it? That is why it becomes the most city with the big reluctant of traffic jam. However, Jakarta is the heaven of culinary foods of Indonesia. You can ind all of the foods that you want to eat. Western food, Japanese food, even traditional food, all of them are avalaible in Jakarta. 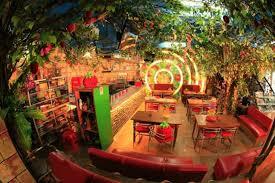 Moreover, there are also many cozy and unique café you can find here. Here are the list of unique café in Jakarta. 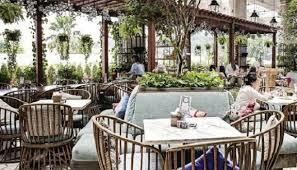 Odysseia is designed like a garden and most of the restaurant area is outdoor. This restaurant, which has been around for more than five years, has two areas, outdoor and indoor. Uniquely, there is a fountain in the outdoor area. Imagine how he exclaimed hanging out in Odysseia in the afternoon when the cool breeze blew. Don’t forget to taste the mocktails and dessert offered at Odysseia. If you want extra sweet, you can order the Crazy Milkshake with a sweet snack. Strawberry Mojito, Peach Strawberry Royal can be a menu choice for those of you who want to drink fresh ones. Many Odysseia menu choices that you can eat with your family or friends. Nanny’s Pavillon does have a French home concept and is unique because each outlet has a different concept. For example, the outlet at Gandaria City carries the concept of a sewing room, in contrast to an outlet in Cilandak Town Square with a garage concept. Likewise, the Nanny’s Pavillon restaurant in Puri Indah Mall, which has a post office nuance, is different from the one in Kelapa Gading with its circus feel. Inspired by the tradition of the family of the owner who often holds large family events every two months. Each family carries its own recipe prepared by nannies or caregivers and eats it in the house pavilion. 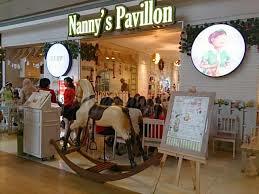 Because of this, the idea of Nanny’s Pavillon was sparked and now success is everywhere. The food menu offered is also unique. The name of the menu is inspired by family names and siblings such as Renee’s Mac and Cheese, Emily Shrimp Pasta, and Arlene’s Stuffed Mushroom. This cafe is a cafe that must be visited by Hello Kitty lovers. As the name suggests, you will meet this Sanrio character in various corners and also in the menus of cafes located at Pantai Indah Kapuk. Although many cafes are inspired by this character, Hello Kitty Café is the only café that has an official license from Sanrio International. Hello Kitty Café serves Kitty Slider, a burger with three flavors; regular, cheese and special sauce Aioli. Pinkwich also don’t miss it. This pink Hello Kitty shaped sandwich contains a filling egg salad. For non-halal menus, you can sample Hot Dogs made from 100% pork sausage with fried eggs, garlic and lettuce. Rolling Stones is the name of a British rock band. In addition, Rolling Stone is also the name of a popular music magazine from Uncle Sam’s country. 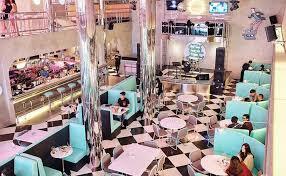 However, we will discuss the Rolling Stone Cafe which just opened in Jakarta at the end of 2010. This cafe is very unique because it features live music as its main attraction. Besides music, the food menu that is served has very unique names, such as Rock and Roll Tenderloin, Old Fashion Fish and Chips, and Grilled White Snapper. Various alcoholic drinks also become the main menu of this cafe. Overall, Rolling Stone is a very cool, unique, and fun cafe to hang out with friends. 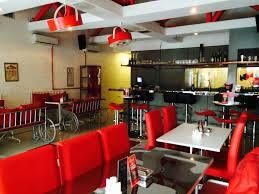 The location of Rolling Stone Cafe is on Jalan Ampera Raya No. 16, Cilandak, South Jakarta. This restaurant is indeed unique and different because it carries the concept of a hospital. 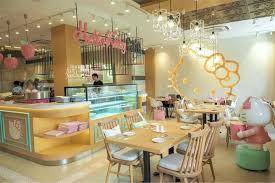 Initially, Hospitalis had two restaurant branches, namely in Kebayoran Baru and Depok. However, even the restaurant in Kebayoran Baru was forced to close and only in Depok you could feel the sensation of hanging out at Hospitalis. From the first entrance to Hospitalis, you will be greeted with tables and chairs and other hospital ornaments clearly illustrated on the walls of the restaurant. Hospitalis is dominated by bright red colors like the Red Cross emblem and also blood. Not only the nuances of the room, you can also enjoy the concept of the hospital through the Hospitalis menu. Don’t be surprised if you order Virgin Mexican Blood, and what comes is a blood bag. 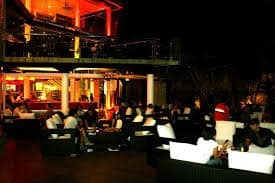 JimBARan Lounge has an outdoor area which is the main attraction. 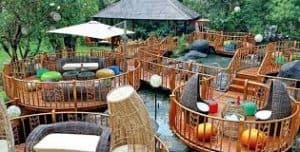 Imagine, here you can enjoy daylight while sitting relaxed in a place that is above the river flow and surrounded by tropical trees. Evenings at JimBARan Lounge are no less beautiful! You can enjoy the coolness of the park with lights that sparkle and accompanied by cool music. JimBARan Lounge is suitable for you who want to spend time in casual meetings while waiting for city traffic. But, that does not mean spending the weekend here is not cool. During weekends, you can also relax and enjoy time with your loved ones. Don’t forget to take pictures at JimBARan Lounge. The place is very instagenic, it must be a good photo spot, so it is always the target of people. How does it feel to be accompanied by cute and pretty cats? Now, you can feel the experience at Leave Cats Cafe. In this cafe, you can enjoy dishes in the form of cakes while playing with cats. You don’t need to worry, because the cats here always pay attention to their cleanliness and health. 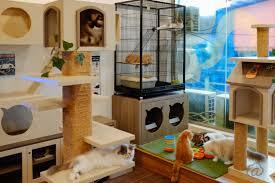 The history of this cat cafe comes from Taiwan. In Taiwan, cafe cat was first opened in 1998. The types of cats in Cutie Cats Cafe vary, there are Himalayan cats, bengal, and Persian. In total there are more than 15 cats in this cafe. If you want to play with cute cats at Cutie Cats Cafe, you have to spend 50 thousand / hour on weekdays and 75 thousand / hour on weekends. This cafe is intended for cat lovers. Because, in the cafe there are books and broadcasts about cats. Cutie Cats Cafe is on Jalan Kemang No. 1 12F, South Jakarta. This restaurant offers you to try the food on the plane. 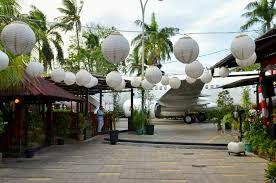 Taman Santap Kayu House does “park” the cabin of Sriwijaya Air’s Boeing 737 400 aircraft which is already unused into the restaurant area located in Taman Impian Jaya Ancol. In the cabin or restaurant Taman Santap Rumah Kayu, it is lined with airplane seats in white and has the dominant wood feel in them. One table contains four chairs, so if your group is more than four people, you will be separated from your friends. In addition to the unique nuances, you will be served with seafood which is no less delicious than other places. In fact, Black Pepper Jumbo Crab which is a favorite menu at Taman Santap Kayu House is also very special. This restaurant serves male crabs which are brought directly from Tarakan and then processed to offer a fresh spicy taste. This restaurant located in Setiabudi was formerly known as Mbah Jingkrak, and after being renovated it turned into Warung MJS. However, the taste and uniqueness of this restaurant has never changed from the past. This restaurant in the form of a joglo house in the 1950s has many unique vintage objects scattered throughout the corner of the restaurant. When you enter you will be greeted with a row of foods that you can choose. The food does look appetizing with colorful flaming sauce. After you have finished ordering the buffet menu, you can enter the dining room which consists of indoor and outdoor. In the room at Warung MJS, a lot of antiques are on display, ranging from a collection of antique tea pots, horse statues, to collections of kris that carry the mystical impression in this room. Seen from the outside, this one cafe is like a big bus parked. When you look inside, you will find a unique cafe with a modern concept. Inspired by the cafe that is often seen in Hollywood films, making Indo Diner a suitable location, not only for food, but also for photography. One menu that is the mainstay of this cafe is cold coffee cream in packs ready to drink with the name Subuh. It is located on Jalan Pluit Selatan Raya No. 40-42, Pluit Penjaringan, West Jakarta. 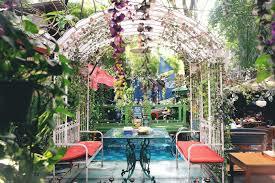 This colorful place resembles an indoor strawberry garden, complete with vines and strawberries everywhere. This café is designed with a strawberry theme, but that’s not all that makes it unique and special. Here, you will find lots of fun games to play. There are special ones for children, there are games to sharpen strategies to be played with friends, until the suitable game is played together with a partner. Strawberry Café also provides WiFi with connections that are quite capable so you can instantly update Instagram, InstaStory, Path or Snapchat. The menu provided is quite diverse, such as Chicken Cordon Bleu with Fries and Spice Fried Chicken Bandung. There is also ice cream with several choices. Oh, and you need to try one of their signature drinks, namely Strawberry Volcano. You can visit this cafe on Jl. Tj. Duren Raya No 10, Grogol Petamburan, West Jakarta. Do you need a quiet atmosphere to hang out with family or friends? 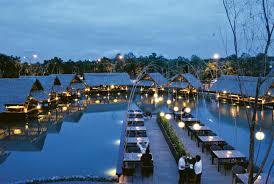 This is a cafe as well as a typical Sundanese restaurant that carries the concept of a place to rest on the lake. All fish / shrimp menus served at Telaga Sampireun come from their own breeding ponds. If you are a fan of Sundanese cuisine, then try their most famous menu, namely Gurame Terbang. Want to try something a little different? Order the Lychee Spice Dori. As a thirst reliever in the hot afternoon, it looks like Ice Orange Coconut is the most appropriate beverage choice. Are you interested in visiting Talaga Sampireun? These are some lists of unique café in Jakarta recommended to visit. Some of them are really comfortable places with wonderful design. You can take your family, friends, or even couples there.